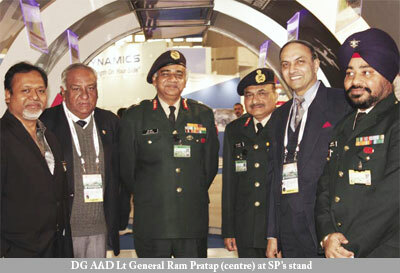 Defexpo India 2010 saw the largest congregation ever of products and companies from across the world. The exhibition ground set the stage for many pacts and deals between global industry giants. The Indian defence market is increasing in size. This was evident at Defexpo 2010 which saw the largest ever conglomeration of companies from across the world. The sixth edition of the biennial Land and Naval Defence System Exhibition held at New Delhi had 650 exhibitors with 200 new entrants from 33 countries. It witnessed an increase in industry participation by about 45 per cent compared to Defexpo 2008. Inaugurating the show, Defence Minister A.K. Antony declared that India will very soon publish the ‘Technology Perspective and Capability Roadmap’. The roadmap highlighting the military requirements of India’s defence forces for the next 15 years shall be displayed on the Ministry of Defence website. It will make the defence pocurement process transparent and speedy. The Defence Minister added that India’s defence expenditure will increase in proportion to the GDP growth of the country. “India’s defence expenditure is about 2.5 per cent of its GDP. The Indian economy is expected to grow at 8-10 per cent for the next two decades. 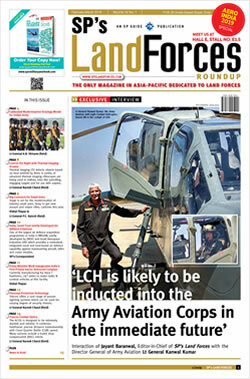 Expenditure on defence in absolute terms is bound to increase in equal proportion,” said Antony. Speaking on the defence offsets policy, the Union Minister informed that changes are being made to render the offsets policy more feasible. “Offset banking is now part of the defence offsets policy and the licensing conditions have also been rationalised. Necessary administrative structures have been put in place in the Ministry of Defence to facilitate offset banking,” he said. Over the years, Defexpo India has grown as an important event in the global defence and aerospace exhibition calendar, showcasing all aspects of defence technologies available worldwide. But Defexpo 2010 had much more on display. Besides the products, the exhibition ground set the stage for innumerable of pacts and agreements between global industry giants. Israel’s Rafael Advanced Defence Systems Ltd declared its plans to start a joint venture with Bharat Electronics Limited to develop advanced missile systems. The proposed facility will be scaled up to develop new technologies in missile seekers depending on the projects it can secure from India. Larsen & Toubro joined hands with Raytheon on a JV to upgrade Indian Army T-72 tanks. As a part of the proposal, Raytheon will provide infrared imaging sights and electronics to improve the target accuracy and increase in overall system lethality for the T-72, while L&T will provide fire control system, sensors and the final integration along with customer support to the Indian Army which retains the T-72 tanks. Thales announced the launch of Vigile LW, a new, lightweight, naval Radar Electronic Support Measures system set to redefine situational awareness for small vessels. Rockwell Collins was awarded a contract for Electronic Counter-Counter Measure radio modules by Electronic Corporation of India Ltd (ECIL). The component hardware card sets will be integrated into ground-based ultra high frequency (UHF) radios for use by the Indian Defence for Command and Control of ground-to-ground and ground-to-air communications. The newly formed joint venture company of Mahindra & Mahindra Limited and BAE Systems Defence Land Systems India unveiled the Mine Protected Vehicle India (MPVI). The first product of the joint venture company, the MPVI will meet the requirements of both the Indian armed and paramilitary forces. With a large seating capacity, the MPVI is capable of safely transporting a complete operational team of army or police forces involved in anti-terrorist and anti-Naxal operations. High power weight ratio and very high torque makes the vehicle suitable for Indian terrain, and especially the mountainous region of Jammu and Kashmir and the bumby landscapes in Naxal dominated areas. “The MPVI is relevant to the needs of our defence forces today. Its enhanced protection technologies will protect the lives of more number of defence forces from mines and roadside bomb attacks. It is critical to India’s defence and security,” said Anand Mahindra, Vice Chairman and Managing Director, Mahindra and Mahindra. The MPVI is based on BAE Systems’ three decades of protection experience that resulted in the highly successful RG 31. “We are extremely proud to unveil the joint venture’s very first product which has been tailor-made for the Indian armed forces,” said Andrew Gallagher, President, BAE Systems. Unveiling three of its new products, the Hinduja Group’s Flagship Company Ashok Leyland, announced its entry into the market for armoured vehicles in India. The three new vehicles showcased were Armoured Stallion, the Armoured Bus and the Mine Protected Vehicle. “With these new offerings, we will serve the forces in other fronts in terms of product opportunities,” said Vinod K. Dasari, Chief Operating Officer and director, Ashok Leyland. The Armoured Stallion is an upgraded version of the Stallion 4X4 vehicle with an armoured cab and lad body for combat war superiority without any compromise on the vehicle’s operational parameters. Armoured Bus has been developed in response to the Indian Army’s requirement to transport army personnel and families in insurgency-infected areas. Mine Protected Vehicle is a multipurpose all-terrain vehicle with high mobility, high protection and multi-mission capabilities. It is a versatile performer.